If you need to electrically isolate two flanges from one another, Pikotek isolation gasket kits can provide excellent functionality. Now you can mitigate galvanic corrosion or provide cathodic protection between two or more dissimilar metals. Over the years, Pikotek insulating gaskets have earned a reputation as the world's most reliable insulating gasket. The company has also developed the only Fire Safe Insulating Kit - VCFS kit - in the world. It's no wonder Drinkwater Products chose to expand its extensive range of pipeline solutions to include a range of gaskets and insulation kits from Pikotek to its offering. 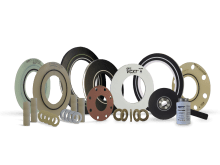 The Pikotek VCS isolating gasket kit consists of an elastomeric o-ring or PTFE spring-energized face seal contained within a permanently bonded laminate stainless steel core. Like all Pikotek insulation kits, the VCS gasket provides exceptional insulation and sealing performance, even in aggressive material application. The unique pressure activated sealing mechanism enables this gasket to provide superior sealing. The Pikotek VCFS isolating gasket kit is a spring-energized PTFE primary sealing element with a secondary seal. The E-ring sits inside an insulating laminate and is permanently bonded to a strong metal core, thus creating a superior, fireproof gasket. The fireproof Pikotek insulation kit has been proven to be capable of maintaining a seal, even at fires of up to 1500°F (815°C). The VCFS Pikotek insulation gasket kit has successfully passed the API 6FB fire test and is covered by three different patents. Pikotek recently introduced their all-new Evolution gasket for multiple applications. The EVOLUTION gasket is a fully encapsulated isolation gasket. This innovative gasket is coated using a GPT proprietary material designed specifically for the oil and gas industry that is extremely abrasion and impact resistant. The coating is also chemically resistant to attack from H₂S, steam, CO, CO₂, and other chemicals found in oil and gas pipelines. When you need superior insulation for your application, it is important to get the right advice from pipeline experts. Drinkwater Products has been in the industry for many years and can provide you with expert service and advice. Contact us today to discuss your Pikotek insulation kits requirements.